Guildford Coal has pitched in to help the small Homestead State School construct a bike safety education track at the school. The school is located on the busy Townsville to Mt Isa highway to the west of Charters Towers in North Queensland. The official opening was held last week (24 April) and was attended by Darren Stockwell, Guildford’s Operations Supervisor, school and P & C representatives and the local Council. The track has already proved to a big hit and will be an important traffic safety tool for the Homestead School community. (L) Students making good use of the new bike safety track. (R) Official opening of the new bike track. A survey of Aboriginal rock art undertaken in late September near the White Mountain National Park, has uncovered significant ancient rock art sites. The area is near Pentland west of Townsville. The Yirendali People, in partnership with Guildford Coal, surveyed an area on the eastern edge of the White Mountain National Park. Townsville based archaeologist, Liz Hatte and Environmental and Licensing Professionals Pty Ltd co-ordinated the project with the Yirendali, with significant funding from Guildford Coal. The project involved teams of volunteers walking a 20 sq klm area of rugged terrain over a 6 day period. A number of previously undiscovered rock art sites were recorded. Guildford Coal’s NQ Project Director, Mark Reynolds, said he was pleased that the company had developed a strong partnership with the Yirendali people in order to complete the project. Jim Hill, cultural heritage coordinator for the Yirendali people, said the Yirendali were pleased to have participated with Guildford in reinforcing their ongoing continuity of families to country. Project archaeologist, Liz Hatte, described the newly documented art as a significant discovery in an area known to contain some excellent Aboriginal art and heritage sites. 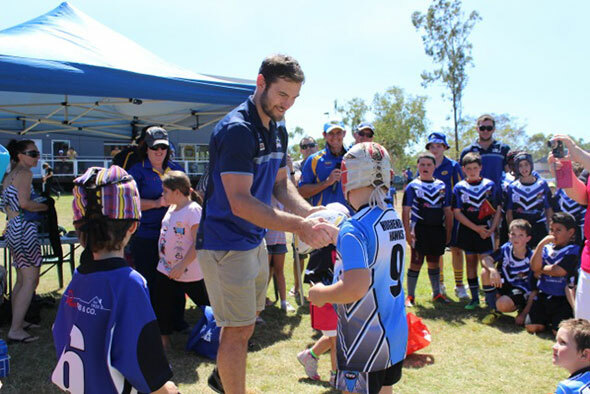 Hughenden Junior Rugby League teams travelled to Townsville in September to do battle with four Western Lions junior teams. The western club struggles to find regular competition and so travelling long distances is often the only option. Guildford Coal was able to help out and Cowboys league legend Dallas Johnson came along to offer support and present awards after each game. Guildford representative, Hon Peter Lindsay, presenting India Atchinson with one of four Guildford Coal Bursaries at the 2012 Charters Towers Eisteddfod. Patrons enjoying the festivities at the annual Pentland Races in 2012, where Guildford Coal sponsored the feature race.